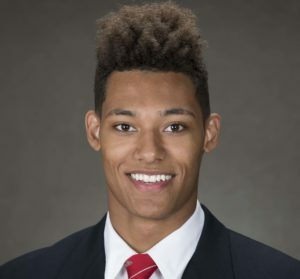 The Wisconsin men’s hockey team will be without leading scorer, freshman defenseman K’Andre Miller when they open a two-game series at Notre Dame. Miller suffered a left leg injury during Saturday’s 4-1 loss to Ohio State. Badger coach Tony Granato said they won’t rush Miller back and will hold him out of action this weekend in South Bend, Indiana. Miller banged his left knee against the end boards while trying to make a play and needed help leaving the ice. Miller leads the Badgers in scoring with 22 points (5 goals and 17 assists), but has slowed to a total of five points over his last eight games. Miller was the 22nd overall pick of the New York Rangers in the 2018 NHL draft, with his raw talent and speed attracting a lot of attention among teams. The Badgers are in last place in the Big Ten Conference at 5-8-5-2 (9-14-5 overall), and plays at Notre Dame on Friday and Saturday.